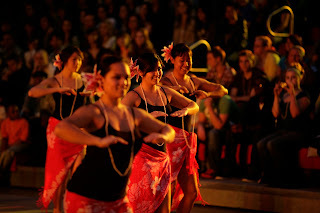 The Whitworth Hawaiian Club, Na Pu’uwai o Hawai’i (The Heart of Hawai’i), will share food and culture with the Whitworth and Spokane communities during the club’s 46th annual lu’au, on Saturday, April 30. The Whitworth Fieldhouse will open at 5:30 p.m., and dinner will be served immediately. Entertainment for the evening will begin at 7:30 p.m.
Tickets are $22 for general admission; $12 for students, seniors (65-plus) and children (6-12); $17 each for groups of 10 or more; and free for children five and under. Tickets are available for purchase on campus at the Hixson Union Building Information Desk, or at the door the evening of the event. Tickets will be sold full-price at the door. For ticket information, call the HUB Information Desk at (509) 777-3796. This year’s lu’au theme is “Hōkūleʻa,” which is a voyaging canoe that travels all over the world using traditional Polynesian navigation techniques. The menu will include rice, chow mein, Hawaiian sweet rolls, tossed salad, macaroni salad, teriyaki beef, kalua pig, shoyu (soy sauce) chicken, lomi salmon, pineapple, pineapple upside-down cake and haupia (coconut dessert). The entertainment portion of the program will feature a pre-show fair before the performances begin. This will include a hula hoop contest, the opportunity to learn how to do basic hula moves, a photo booth, and other games. There will also be a raffle giveaway and an opportunity to buy authentic Hawaiian goods.